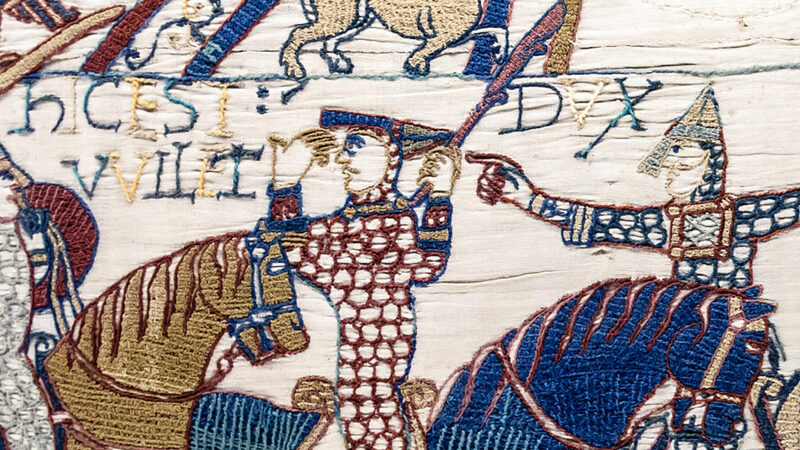 William the Conqueror, 1066, an arrow in the eye. The Battle of Hastings is one of those events that sticks in the mind. It was a defining moment in English history, and without the Normans we wouldn’t have castles dotted up and down the country. So how much do we know about what led to this point, and what happened at Hastings? Why did William invade England? 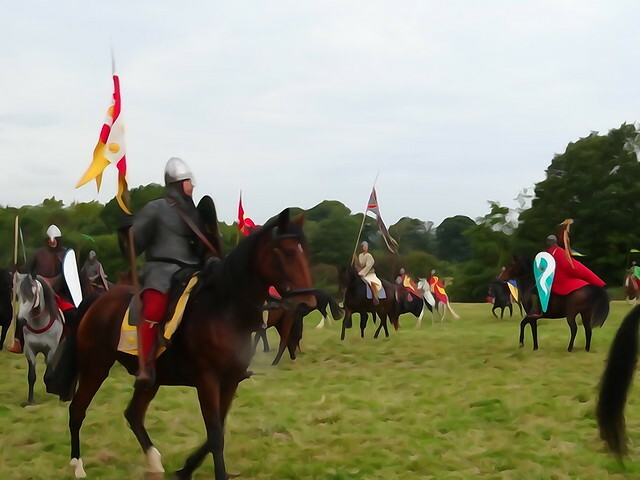 The story of the Norman Conquest and the battle of Hastings goes back before 1066. In 1051, Edward the Confessor promised William, Duke of Normandy, that when he died the Norman would become king of England. Harold Godwineson – a powerful Anglo-Saxon earl – met William and swore would recognise the duke’s claim to the English throne when Edward died. But there was a twist still to come. Edward the Confessor fell ill late in 1065, and on his deathbed made Harold his heir. On hearing the news of Edward’s death and Harold’s coronation, William sent a message to the pope, asking for his permission to invade England and take the crown. 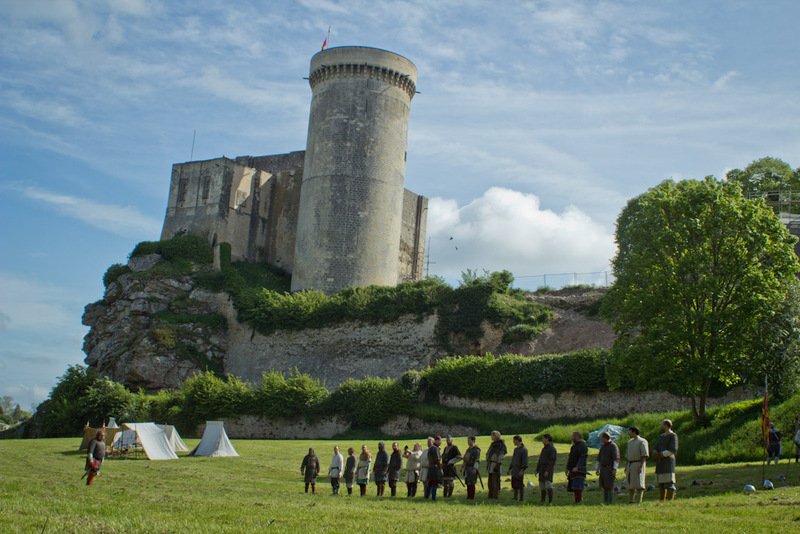 Chateau de Falaise in Normandy, where William grew up. Photo by Elisa Pictures, licensed CC by NC-ND 2.0. Harold had fought alongside William and expected the duke to attempt an invasion. The new king of England raised an army in May 1066 and camped in the south of England, ready to fight. With the pope’s support, William built a fleet of ships for his army but bad weather prevented them from crossing the Channel. This delayed the invasion for so long, that in early September Harold disbanded his own fleet of ships. 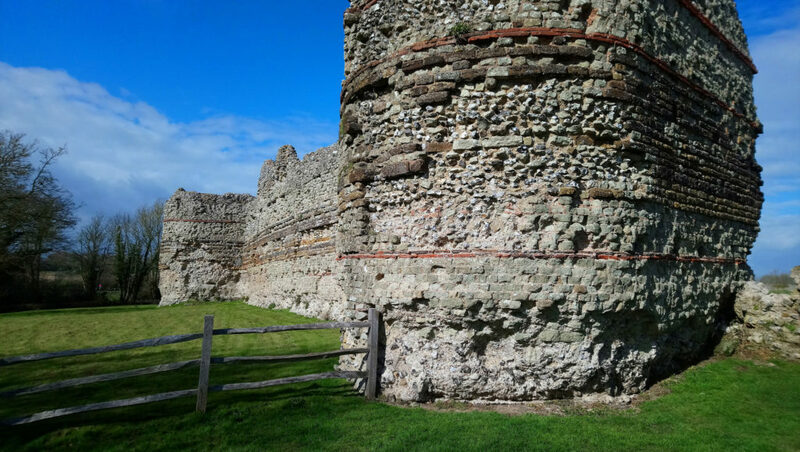 William landed at Pevensey Bay on the morning of 28 September 1066 and fortified the nearby Roman fort. Photo by Richard Nevell, licensed CC by-SA 2.0. Harold’s younger brother, Tostig, was in exile and had been raiding England. In September he and Harald Hadrada, king of Norway, landed 300 ships in northeast England to claim the English throne. At the battle of Fulford on 20 September they defeated an Anglo-Saxon army led by the earls of Northumbria and Mercia. Harold marched north, and on 25 September faced the invading army at Stamford Bridge in Yorkshire. Tostig and the Norwegian king were both killed in the battle, ending in victory for Harold. While Harold’s army was recovering after a bloody battle and a long march, William’s luck changed. The weather turned, and he set sail across the Channel on 27 September, landing at Pevensey Bay in Sussex on the morning of 28 September. William and his Norman, French, and Breton soldiers set up camp in the Roman fort at Pevensey. They began raiding the local area which happened to belong to King Harold himself. News of William’s arrival reached Harold in York on 1 October. He reacted to the news (and the insult) by marching back south, going via London to collect more soldiers. William had moved his army from Pevensey to Hastings, a few miles away. On the morning of 14 October 1066, Harold marched his army to the ridge now known as Senlac Hill. He planned to fight on the defensive which suited strength of the shield wall. William’s forces arrived from the south. The two armies, both around 7,000 strong lined up for battle. The sound of trumpets marked the outbreak of fighting, and William made the first move by advancing his foot soldiers up the hill with the cavalry following. The shield wall was a fearsome obstacle, and hard to break. Harold’s disciplined army resists William’s first assault. As the first wave retreated, a rumour ran through the Norman ranks that William had been killed. Knowing he had to rally his soldiers or lose the battle, William rode in front of his army and lifted his helmet so they could see he lived. 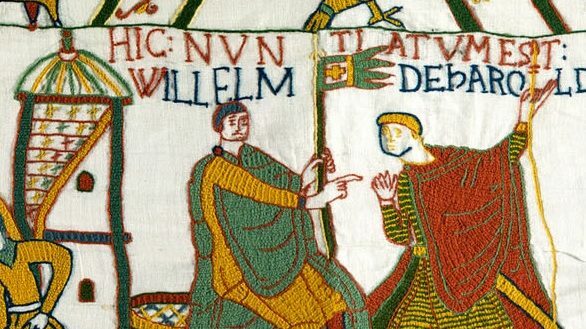 Tapisserie de Bayeux – Scène 55 : le duc Guillaume se fait reconnaître. Seeing the Normans fall back, part of Harold’s army followed them down the hill, attempting to route them. William managed to bolster his soldiers in time to turn and face the attack coming down the hill. Outnumbered and out of formation, Harold’s men had given up the advantage of the shield wall and were defeated. Seeing how effective this was in reducing the strength of Harold’s army, William pretended to retreat another two times. The ruse worked each time, giving William the advantage. In the midst of the hard fought battle, King Harold was killed. 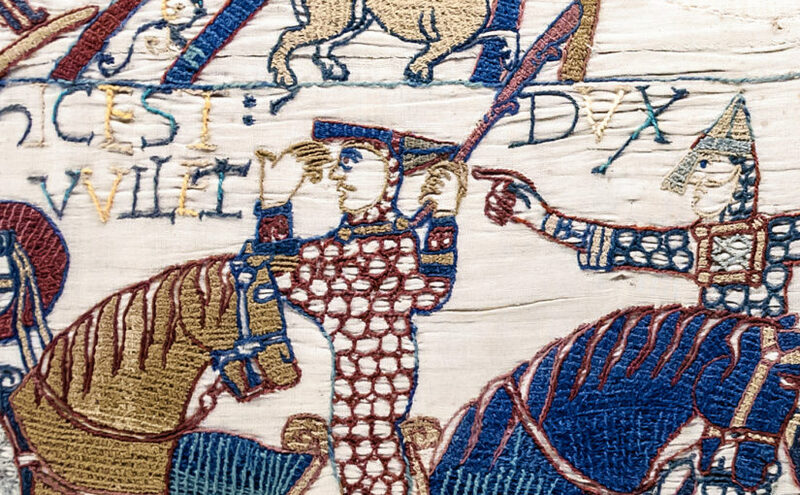 The Bayeux tapestry seems to show that he was hit in the eye by an arrow, while contemporary chroniclers suggest he was hacked down in the fighting. Either way, with their leader and his brothers dead, the Anglo-Saxon army broke. Afterwards, William marched through southeast England, capturing important towns before arriving in London. He was crowned king of England on Christmas Day 1066 in Westminster Abbey. 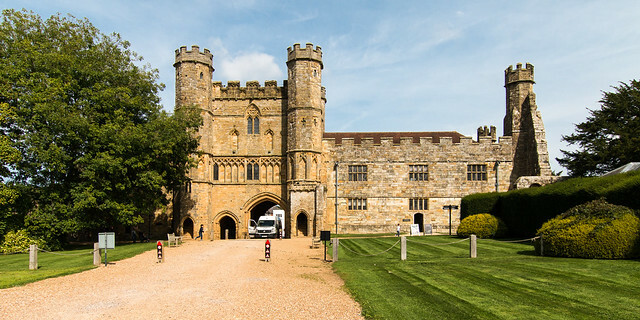 William ordered the construction of Battle Abbey on the field where he defeated Harold, with the high altar over where Harold fell. To secure the conquest, William and his supporters built castles across the country, especially in important towns like Lincoln and Norwich to control the area. The Norman Conquest led to the age of the castle in England. Make your own scene in the style of the Bayeux Tapestry and share it with us on Twitter. If you want more on Hastings and its impact you can read Peter Purton’s blog post or the Oxford Dictionary of National Biography’s entries on William and Harold which were used when writing this piece.